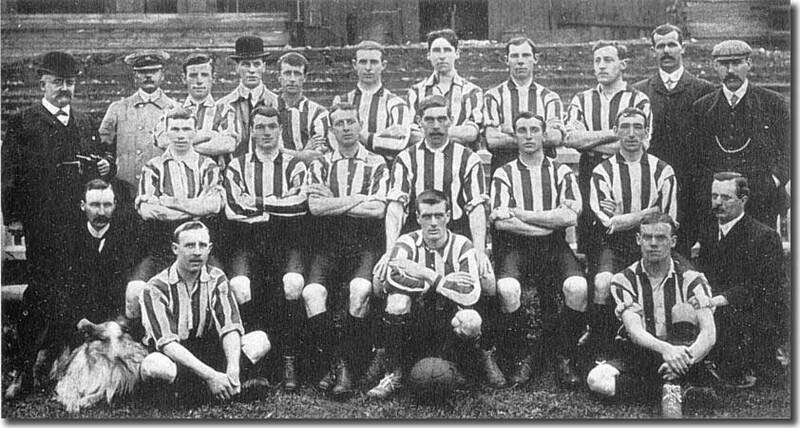 Having joined the Second Division for 1905-06, Leeds City made a good fist of it in their first season, finishing sixth out of 20 clubs. In addition, Rugby's monopoly with the locals finally seemed to have been broken, with Leeds RL's average gate numbers falling by nearly 50% in that first League season. That must have been extremely satisfying for all those Yorkshiremen who had shown such faith in getting things off the ground over the previous 20 years. To show the club's ambitious intentions, a new stand was built: the Scratching Shed was to last 70 years and to see many changes at Elland Road. City didn't do quite so well in 1906-07, but they did manage to sign centre-forward Billy McLeod from Lincoln City. McLeod was a reliable goal scorer and scored 15 goals in just 23 appearances in the league that year, but could not help the club to manage more than a mid-table finish, which was where they remained most seasons before the First World War. McLeod went on to score a total of 171 goals in 289 League appearances with Leeds. McLeod was bought to replace centre-forward David 'Soldier' Wilson who had died at the home game with Burnley in October 1906, aged just 23. Leeds had bought Wilson from Hull City in December 1905 for £120 and he was an immediate success, finishing top scorer in his first season, despite only playing 15 games. 1907-08 was no better than the previous year with City finishing 12th. Manager Gilbert Gillies' contract was not renewed. In March 1908, Frank Scott-Walford took over as secretary-manager from Gillies, after finally being released by Brighton following protracted negotiations. He brought in many of his trusted Brighton players, yet none made a lasting impact. Even though Tom Morris, said to be the best defender in the Second Division, was introduced in the latter half of 1908-09, no real improvement was made. Scott-Walford later switched his attention to Ireland and brought a host of up-and-coming players to Elland Road. Unfortunately the newcomers had little impact. In 1909-10 City flirted with relegation, finishing a lowly 17th, and after a mid-season finish in 1910-11, the club had to apply for re-election at the end of 1911-12 after a dismal season, leading Scott-Walford to resign. All Scott-Walford's buys were cheap - most came and went without making much impression. From his Brighton days, only centre half Morris had merited a regular place on the team. Full back George Affleck, signed in autumn 1909 from junior football in Scotland, became an established partner, yet the defence which also included Alec Creighton (ex Distillery), Scotsman John Harkins and the long serving Stan Cubberley, was often erratic: sound in the second half of 1910-11 as City finished 11th, but chaotic during the following year. Much had been expected of Scott-Walford, yet in retrospect he turned out to be naive, relying on unproven players. Of course, he had little choice but to take risks with unknown quantities - Leeds City had little cash available to buy proven talent. Leeds City reached a low point when its bankers decided to call in the club's £7,000 overdraft, which would effectively put City out of business. Chairman Norris Hepworth poured in more cash and appointed Mr Tom Coombs as Receiver. Coombs was to run City's affairs for three years as the club lurched from one financial crisis to another. The extent of Hepworth's generosity was revealed at a public meeting at the Grand Central Hotel in April 1912. The club's major benefactor had invested the then huge sum of £15,000 on trying to keep City afloat. An extraordinary general meeting at the Salem Hall, called to try and sort out the whole miserable mess, revealed that total liabilities were £15,782, total losses since the club's formation were £11,321 and assets stood at £7,084. The meeting agreed that the company should be wound up and that Coombs should run the club. And then came the arrival of Herbert Chapman as manager. He had made an impact in his first managerial role at Northampton Town, and he was to become the most famous British manager of the next two decades, with Huddersfield Town and Arsenal, winning 4 League titles and 2 FA Cup finals. Chapman campaigned vigorously to keep City in the League and on 4 June, they were re-elected comfortably enough with 33 votes. Lincoln City (27 votes) replaced Gainsborough Trinity, who managed only nine votes. He also confidently predicted that he could take Leeds into the First Division. The 1912-13 season began with renewed optimism and Chapman's team made a useful start. There were more off-field problems, however, this time with the Football League. During the summer Chapman signed three players - Billy Scott, George Law and Evelyn Lintott - agreeing to pay each of them the full year's wage of £208 to the end of the following April. But two months had already elapsed since the end of their previous contracts. In effect, the players were getting more than the permitted wage of £4 per week. Aston Villa had fallen foul of the League for the same offence and when their case came to light, City realised they had unwittingly breached the rules and reported themselves. The League were swift to act and City were fined £125 plus expenses and the players were ordered to return the excess payments. Despite these problems, Chapman was an inspiring leader and the club finished sixth in his first season, with McLeod netting 27 League goals out of a club record of 70 for the season. Highlight of the season was a 5-1 thrashing of eventual Champions Preston in February. Chapman was now becoming heavily involved in the club's affairs and was particularly anxious to improve team spirit. 1913-14 saw City come within two points of promotion in 4th spot, thanks to quite brilliant form at Elland Road where they set up a club League record by thrashing Nottingham Forest 8-0. Large crowds rolled up to see Ivan Sharpe's wing-craft creating goals for the mercurial McLeod, whilst goalkeeper Tony Hogg proved an exciting discovery. Again McLeod had a good return, netting 27 goals in his 37 games. Things finally seemed to be improving financially as well with the club generating a profit of £400, after enormously improved attendances. There were regularly more than 20,000 fans at Elland Road that year and they drew 30,000 for the visit of Fulham. The club looked better financially as well as on the pitch and in August 1914, a syndicate of Leeds sportsmen, headed by Mr Joseph Connor, president of the West Riding FA, came up with an offer to run the club. Their offer of a payment of £1,000 plus an annual rent of £250 for Elland Road was accepted by Coombs. Things seemed to be heading in the right direction at last and City were confident of promotion at the start of 1914-15. Disappointingly, however, the side never matched their form of the previous year and finished 15th in the last season before the suspension of the official Football League programme during the war years. McLeod had another useful season though and finished up with 18 goals in 31 games. During the war Leeds were unexpectedly successful when more than 30 guest players, including many internationals like Fanny Walden and Charlie Buchan, appeared for them. City won the unofficial League Championship by beating the champions of the Lancashire League after winning their own section, but this was a completely unofficial achievement. The four year gap seemed to rejuvenate the club and when the League programme proper resumed in 1919-20, Chapman's men made a useful start to the season, with ten points from eight games, with McLeod already hitting 9 goals. But then, things went badly wrong. Leeds City Football Club was suspended and eventually expelled from the Football League after an astonishing scandal involving alleged illegal payments to players during the war years.